What fun to place the final Matthew in the Middle book into the hands of the grandson to whom it’s dedicated! 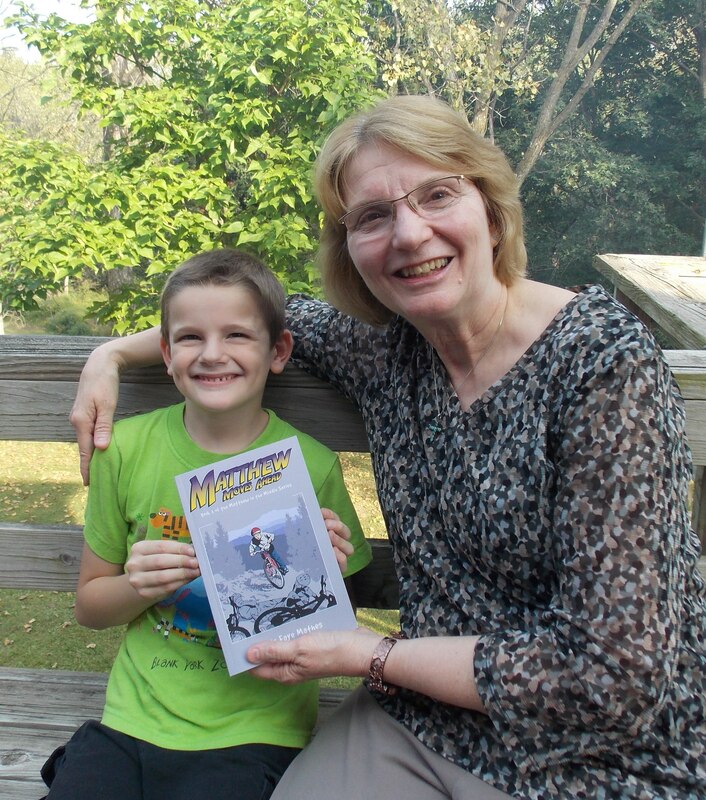 The first book in the series, Matthew Muddles Through, is dedicated to my oldest grandson. The second book, Matthew Makes Strides, is dedicated to my second grandson. And this third book, Matthew Moves Ahead, is dedicated to my third grandson. The boys are all brothers, sons of my oldest son. My book boy Matthew grew for more years than his age. Although Matthew is eleven, his story is thirteen. He was an experiment, conceived in a fiction writing course I took in 2002. I challenged myself to write in a point of view very different from personal experience. Could a boring and sedentary mature woman write the first-person perspective of an imaginative and active young boy? I named that embryo Caleb to reflect the faithfulness and zeal of the biblical believer who urged the Israelites to fight the giants and enter the Promised Land (Numbers 13:30), and who at eighty-five years of age remained eager to fight for the Lord (Joshua 14:6-12). Military matters interested Caleb, the middle child in a minister’s family, who befriended a Vietnam veteran named Fred Winters. The initial short story began with Caleb washing his toy soldiers in the bathroom sink and went on to show him playing a basketball game with his older brother, while Dad spoke to Mr. Winters in the kitchen. I hadn’t planned that basketball game. It just happened. I loved this imaginary family. And my instructor loved the story, calling the scene with the two boys playing basketball in the cold “beautiful.” He suggested I submit another Caleb narrative as my next assignment. That second short story described the chaos of a Sunday morning when everything goes wrong. Later that day, Mr. Winters shared a glimpse of his tormented past, and Caleb witnessed to him about the truths of God’s word and how those things are worth fighting—and dying—for. The story concludes with the two going upstairs for apple pie. Readers of Matthew Muddles Through will recognize these stories in Chapters 10, 14, and 16 of that book. My book boy grew in the womb of my imagination until he was born in 2007 as Matthew Henry Vos. Exactly like parents who decide on the right name once they see the baby, I knew this was the perfect choice. But the poor fellow experienced a sickly childhood, suffering through innumerable surgeries and lengthy hospitalizations. Blog reflections on these can be found on my website: glendafayemathes.com. Plans for his entrance into society changed from one novel to four, to three, and back and forth between four and three a few more times. Matthew survived preliminary auditions in 2009 and flew to the big city in 2010 to make a name for himself, but returned home feeling rejected. Occasionally I visited him while he languished in recovery. Well! If my grandson wanted to read Matthew’s story, I wanted to give it to him before he lost interest. And he was almost a teenager. I determined to place the first book in his hands for his thirteenth birthday. Matthew now lives in the hearts and minds of more readers than I’d ever imagined. Thank you for the books you wrote. They are very good books. I liked them a lot! They are the best books I have ever read! I liked them because they are Christian and Reformed. I liked them too because they were very interesting! There were no bad words or bad pictures in them! I learned not to be selfish, to obey our parents, not to get angry at them, and to help others whenever they are hurt! It’s finally here, Asher. Enjoy. Wes was happy to receive his signed copy of Matthew Moves Ahead. What do you like about the books? Please comment below. What fun to enjoy such great books! I’m blessed to have such a talented mom!